The childhood of celebrated Jewish author Sholom Aleichem, whose writings inspired Fiddler on the Roof, was marred by the death of his mother, poor economic conditions, and his loving father’s remarriage to a hateful woman. Sholom found solace and power in making others laugh, a gift that helped him pen more than 6,000 essays, plays, and novels in his lifetime. Silverman relays the story with touches of sadness, playfulness, and hope. Gerstein’s ink-and-watercolor illustrations are an excellent match, contrasting Sholom’s impishness against the step-mother’s harshness. Pair this with Simms Taback’s Kibitzers and Fools: Tales My Zayda (Grandfather) Told Me for an amusing look at Jewish culture. 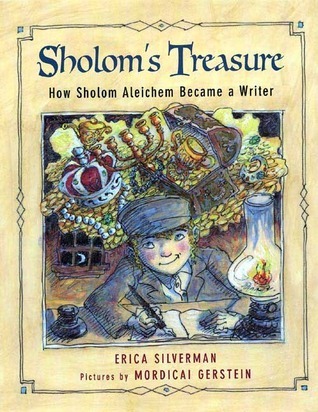 Hear an interview about Sholom's Treasure with author Erica Silverman and illustrator Mordicai Gerstein on The Book of Life podcast's January 2006 episode at www.jewishbooks.blogspot.com.